A city! It is the grip of man upon nature. It is a human operation directed against nature, a human organism both for protection and for work. And he encamped facing the city. Man governs his feelings by his reason; he keeps his feelings and his instincts in check, subordinating them to the aim he has in view. His experience is born of work; man works in order that he may not perish. In order that production may be possible, a line of conduct is essential, the laws of experience must be obeyed. Man must consider the result in advance. But the pack-donkey thinks of nothing at all, except what will save himself trouble. Yaakov is purposeful, rational and directed. His brother, Esav, like Le Corbusier’s pack-donkey, is meandering on the path of least resistance in his thuggish “give-me-soup-now” lifestyle. The pack-donkey represents for Le Corbusier the winding alleys of the European medieval town with its unplanned sprawl. Those meandering pathways of the pre-modern age are contrasted with the efficient, congested, forward-looking, over-worked and hyper-planned modern city of Man, with their grids, tunnels and highways. The message is clear: be a man! 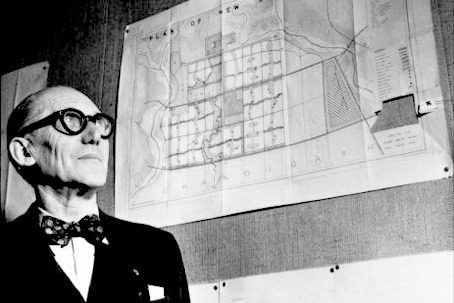 When Le Corbusier describes “A city! It is the grip of man upon nature. It is a human operation directed against nature…” the dramatic entrance of baby Yaakov into the world comes to mind: gripping his brother’s heel. From the very moment of his birth he is defying natural order, and thus receives his name: “Yaakov/Heel-Holder”. This is the promise of the city: constant upward mobility, a constant nature-defying rise higher and higher, further uptown and further up to the top floors of the skyscraper. There is always someone to compete with as you attempt to ascend the ladder of success. But with Yaakov it becomes pathological. He cannot find satisfaction in what he has: be it being second born, or having Leah, or living with Lavan. This happens because he seems to lack an authentic core: there is no “there there”. Yaakov’s essence does not belong to him, but to the person ahead of him, whose heel he is trying to grab. Yaakov’s MO is one of avoidance and manipulation rather than confrontation. He bribes and parries instead of facing the music. Yaakov learns his lesson: Lavan and his daughters teach him a thing or two about trickery and impersonation. But nothing much changes until the night in which Yaakov stops running and scheming and – scared out of his wits from having to confront his brother – Yaakov confronts “a man”. He only has himself, and that is enough. He confronts, until his own leg is held. In that moment, Yaakov receives a new name: “Not as Yaakov/Heel-Sneak shall your name be henceforth uttered, but rather as Yisrael/God-Fighter, for you have fought with God and men and have prevailed.” (Gen. 32:29-30). Having confronted, Yaakov can own his own story. “And Esav said: I have much” – meaning I have much but not all, but Yaakov said: “God has shown me favor – I have all”. ויאמר עשו יש לי רב - שמע רב אבל לא כל, ויעקב אמר כי חנני אלהים וכי יש לי כל, לפי שהרשעים אע"פ שיש להם כל כסף וזהב שבעולם מ"מ נראה להם שעדיין הם חסרים, ויש להם רב אבל לא כל צרכם, ...והצדיקים בהפך זה כי אפילו אם יש מעט בידם הם מסתפקים בו ושמחים בחלקם, ונראה כאלו יש להם כל. I’d suggest that this paradigm shift, from having “much” to attaining “all” is played out in Yaakov’s action in the city of Shechem: he is drawn to the city, but also keeps a distance, remaining "encamped facing the city". We are a long way away from Le Corbusier’s wide-eyed modernism. The time of mere accumulation as a sign of advancement is gone. We no longer have the privilege of the illusion of “progress”, or even the comfort of the superiority of rational behavior. Many people would give their “all” for the privilege of some meandering. Yet as we live our lives in cities designed according to Le Corbusier’s guidelines, constantly moving from one place to the next, purposeful, productive, achieving, grabbing the heel of the next challenge and moving on up in our search for “much” - we must also work in some distance and perspective. As we ponder how our surroundings shape our self-understanding, we would be wise to make sure we not only take advantage of “the city”, but also take the time to “encamp facing the city”, as Yaakov did. From that encampment we might be able to recall that it is not about the game of “much”, it is about holding on to the “all”, and working from there. Rav said: He established (tikken) coinage for them. Shmuel said: He established (tikken) markets for them. אמר רב: מטבע תיקן להם. ושמואל אמר: שווקים תיקן להם. ורבי יוחנן אמר: מרחצאות תיקן להם. Yaakov is described here as a great urban planner, the establisher of the efficient, safe and clean urban dwelling: currency, commerce and hygiene. Upon arriving at the city of Shekhem, Yaakov embraces his new identity as Yisrael. His shift from “much” to “all” is not a satiated rejection of capitalism, but rather an embrace of regulation. He doesn’t deny the city, rather he seeks to establish in it, establishing being the opposite of pathological competing. He seeks structure, not opportunism. He regulates rather than undermine. He encourages transparency and cleanliness instead of murkiness. These are the actions of one who has “all”. The midrash about establishing markets and coins becomes a paradigm for “tikkun” in the Talmud. This midrash is quoted in the heart of the Rabbi Shimon Bar Yochai in the Cave story. Two striking aspects to this quote: Yaakov is described as establishing the three things which at the beginning of the story, the Romans are described as doing (with apologies to Monty Python): “How pleasant are the acts of this nation: They established (tiknu) markets! They established bathhouses! They established bridges!” Moreover, when Rabbi Shimon Bar Yochai learns his lesson and leaves the cave, he says: “Since a miracle occurred for me, I will go and fix some-thing, like our ancestor did,” referring to Yaakov.